Prayer in public schools and at public meetings, aspects of the Affordable Care Act that violate religious conscience, how much freedom from government interference should religious institutions have, the role of the military chaplaincy—all these issues and more raise questions as to the permitted extent of governmental involvement in the affairs of religious and how much influence and preference should religious groups be given in the affairs of state. Lupus and Tuttle explore these issues within the bounds of their thesis: We in the United States may be a religious people, but we have a secular government. The authors develop their basic arguments early on. They argue that the Constitution does not mention a Supreme Being in the body of the test (presumably the phrase in the preamble stating “. . . secure the Blessings of Liberty to ourselves and our Posterity . . .” should not necessarily imply anything about the ultimate source of those blessings). Furthermore, they state that the authority of law is not dependent upon those laws being revealed by a deity. One could possibly argue that the principles embodied in the document might be derived from basic Judeo-Christian ideas, but it might be challenging to make that point. A key idea in the discussion is what the writers term the “Nonestablishment Clause” drawing from the first amendment: “Congress shall make no law respecting an establishment of religion, or prohibiting the free exercise thereof . . ..” The idea behind this thesis is that government does not have a religious nature of its own, but serves to protect and facilitate the religious activities and organizations of its citizens. There is no “official” state church, but there also should be no interference with the religious activities of the citizens—government is to remain neutral in its support or opposition to any specific religious practices or church structures. The idea of “rights” is a central focus of the discussion. One group may feel they have a right to be free of any coercive religious activity (such as mandatory prayer in schools or at the beginning of a public meeting). They expect the government to ban all such activities so as not to violate their freedom. The other group believes that religious individuals and organizations have the right to be fully involved in public affairs and expect the government to actively support their participation through funding and equal time allocations. Secular Government, Religious People seeks to navigate the often treacherous waters between these two positions. Several significant issues have developed in the church-state environment in recent years. With the extreme liberalism taking place in some mainline Protestant denominations, many individual congregations are seeking to sever their ties with the denomination and look for new affiliations. One problematic issue deals with ownership of church property. The courts have often been called on to adjudicate these disputes, especially when original ownership issues are unclear. Other court suits have revolved around questions of the proper hiring and firing of employees, especially those who violate the basic tenets of faith as laid down by the church organization. At present, there is considerable controversy over executive orders from the Obama administration that appear to take away the rights of religious groups to enforce their moral standards on employees. Unless some exemptions are granted (as they have been under previous administrations, both Democratic and Republican), serious disruption of a number of national and international social programs might occur. The acknowledgement of religion in the public schools continues to generate controversy. Prayer and Bible reading spark debate (whether in class or as extracurricular activities). The authors look closely at issues impacting teachers who are Christians and ask what limits may appropriate in restricting their free expression of their faith in and out of the classroom. Graduation speeches also spark debate (and some “civil disobedience”), especially with regard to student speakers. Lupu and Tuttle give us an in-depth analysis of the military chaplaincy issue, looking at both the limits of government support and the reasonable expectation that the government facilitate expression of religious belief and practice for a somewhat “captive” group of military personnel. This debate is only expected to continue in the future. The book contains thorough documentation of the course cases and rulings, representing a very comprehensive coverage of the relevant legal materials. 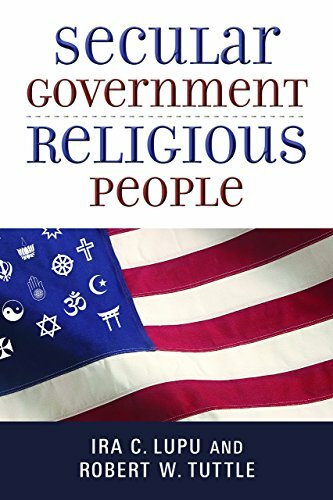 Secular Government, Religious People provides an excellent overview of the church-state climate today and points to some practical and realistic solutions to the troubling issues we face in our nation. Donald F. Calbreath Ph.D. is a retired professor of chemistry who taught for 22 years at Whitworth College (now Whitworth University) in Spokane, WA, as well as the author/presenter of numerous papers and articles involving both science and Christianity. His writing has been published in such venues as Perspectives in Science and Christian Faith. At Whitworth, he created a course, “Molecules and the Mind,” which dealt with scientific, ethical, and religious aspects of the neurosciences.